Zac Goldsmith MP and the Environment Secretary, Michael Gove, with the Tusk Trust rhino artworks. Today there has been coverage from ITV News, Financial Times, the I, Daily Express, the Yorkshire Post and the Aberdeen Evening Express on Environment Secretary Michael Gove’s call for countries around the world to come together to tackle the illegal wildlife trade (IWT). 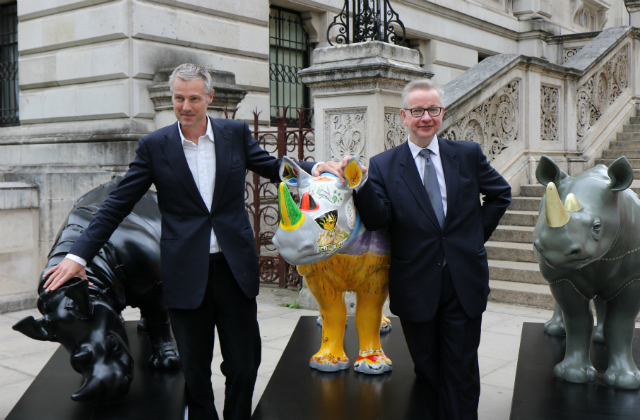 Mr Gove was speaking during a visit to see the Tusk Trust rhino trail artworks, just three weeks before the UK hosts a major international conference on IWT. He was joined by Richmond MP and IWT conference champion Zac Goldsmith. Rhino poaching is disastrous: In 2007, 13 rhinos were poached in South Africa; in 2015 that number rose to 1,175, out of a global population of fewer than 30,000. According to WWF, powdered rhino horn is used in traditional Asian medicine as a supposed cure for a range of illnesses – from hangovers to fevers. The artworks will be auctioned to raise funds for rhino conservation efforts and are currently on display around central London. During October (11/12), the fourth international Illegal Wildlife Trade conference will be held bringing together political leaders and key individuals and organisations to combat this vile trade. Illegal wildlife trade is one of the biggest threats not just to biodiversity on this planet but to the stability and chance of progress in the developing world. Every day hundreds of special, precious, iconic species are slaughtered in pursuit of greed, and we need to take collective action. Countries in the developing world have said to Britain that we have a key role as a leader, a convener in bringing nations both where animals are facing devastating pressures and also bringing together countries where there is still a demand for this trade. It's only by acting together we can safeguard natural life on this planet. Just as we've got together to take on the challenge of climate change, we need to get together to take on the challenge of making sure we have our wildlife, flora and fauna protected and habitats enhanced. The world, collectively, has taken action in order to set ambitious goals to deal with climate change, and I think we need to show a similar level of ambition when it comes to making sure we safeguard wildlife and biodiversity. Today’s Times reported on the Consumer Council for Water’s (CCWater) annual customer complaints review. This year’s report shows that nine out of 21 water companies in England and Wales reported an increase in calls from customers reporting problems. While the number of complaints overall across the industry fell during the last year, there was a 10 per cent rise in the number relating to water supply, as some water companies struggled with the disruption caused by the sudden thaw following March’s ‘Beast from the East’. 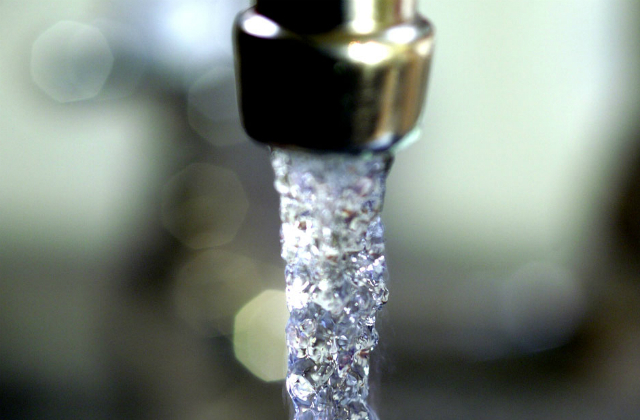 The three worst performing water companies - Bristol Water, Surrey based SES Water and Southern Water - have been asked to provide CCWater with quarterly reports highlighting what action they intend to take to reduce customer complaints. Customers expect a resilient and reliable water supply with excellent customer service. The improving performance by some water companies shows what can be achieved and we expect that from every company. But this report shows that, in particular, Southern Water really needs to up its game after three years in a row as the worst performer for customer complaints. I’m pleased the watchdog is highlighting what more needs to be done for customers. There was further coverage in The Mirror, ITV News, BBC News and The Daily Mail.